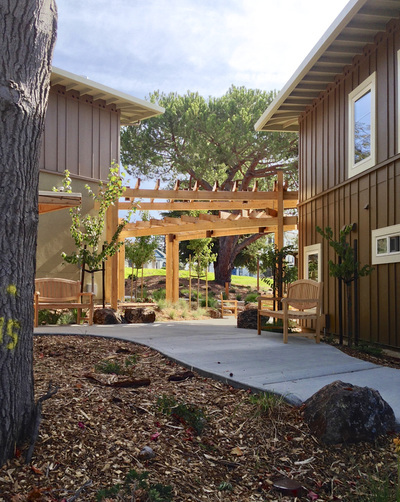 Teenagers in foster care often find themselves alone when they turn 18 and ‘Emancipate’ (age out) of California’s Foster Care system. 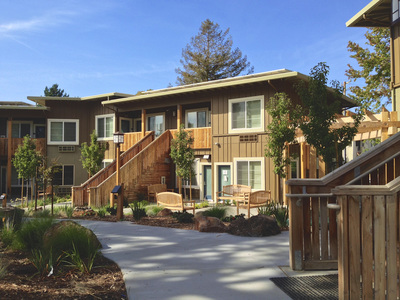 The homelessness rate for these kids is extraordinarily high. This project provides transitional housing where these youth can learn independent-living skills, allowing them to succeed on their own. 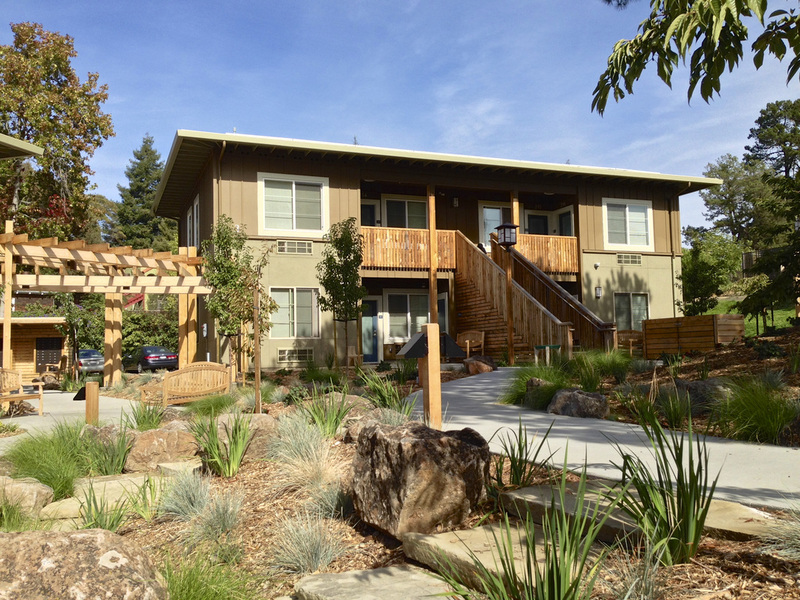 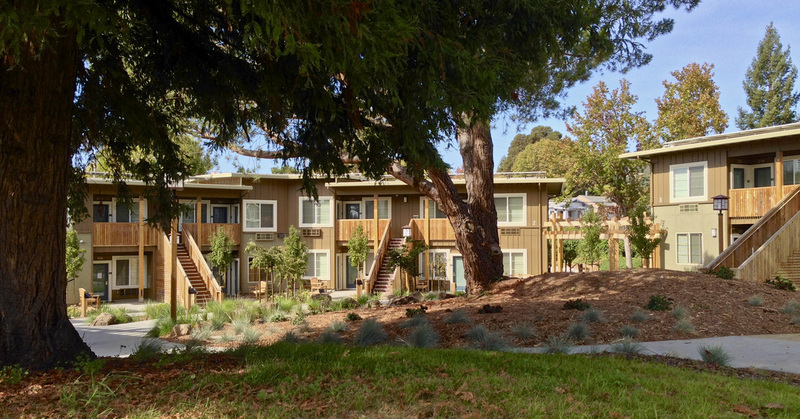 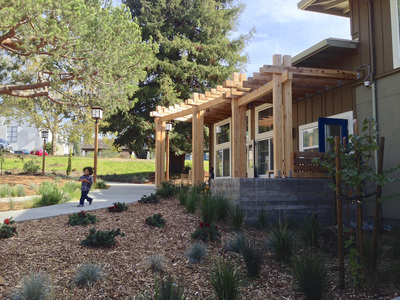 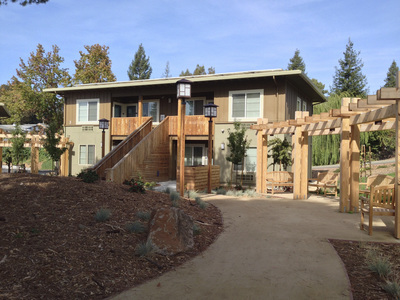 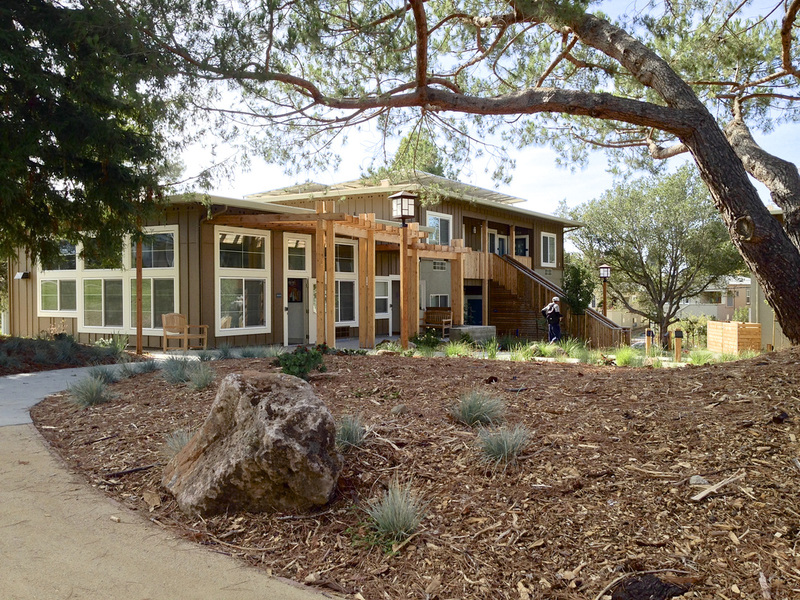 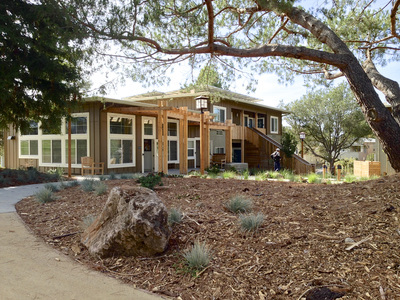 This housing was added to the campus of the Fred Finch Youth Center, a non-profit dedicated to serving foster youth in the Oakland area . 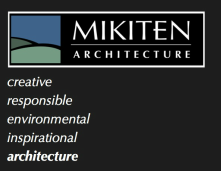 They had vocational, educational, behavioral, and health support services already on site, and came to Mikiten Architecture for the housing. Emancipated Youths can live here for up to two years, learning life skills and navigating their way to education and employment. 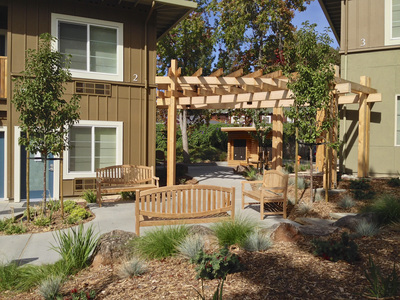 Rising Oaks won high praise in the Design Review process for it’s gentle presence in the neighborhood, and the curving geometries of the community spaces on the site’s very social interior courtyard. 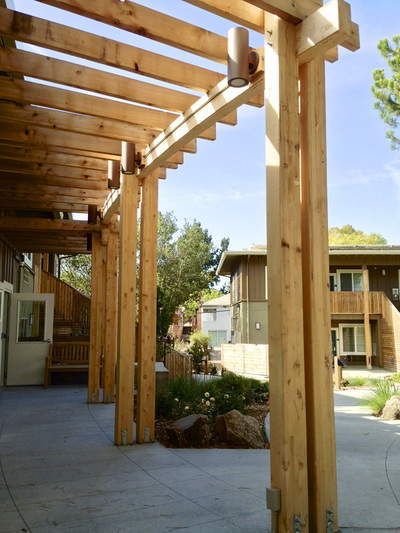 The building and site design merge together here, creating both communal and intimate spaces for the residents to relax and feel grounded in protected Nature. 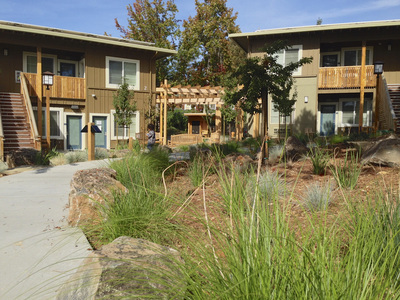 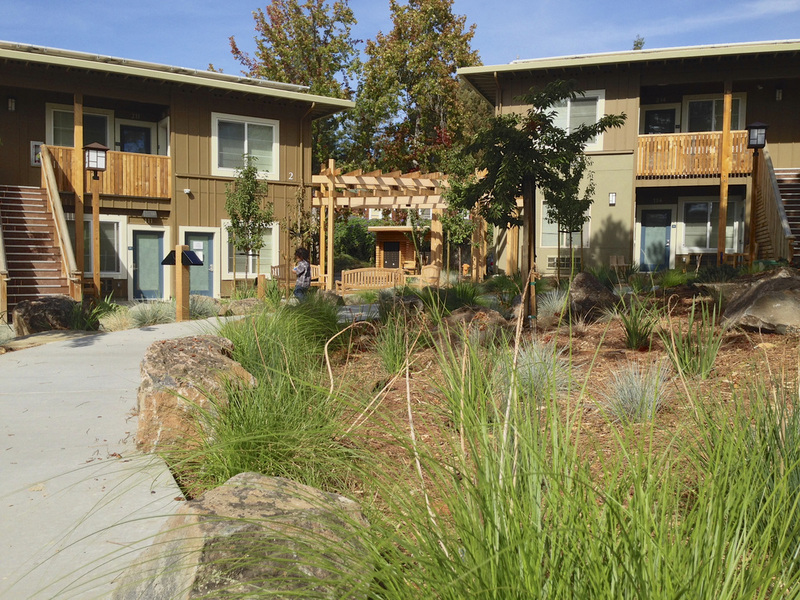 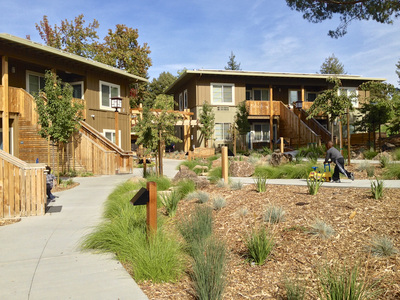 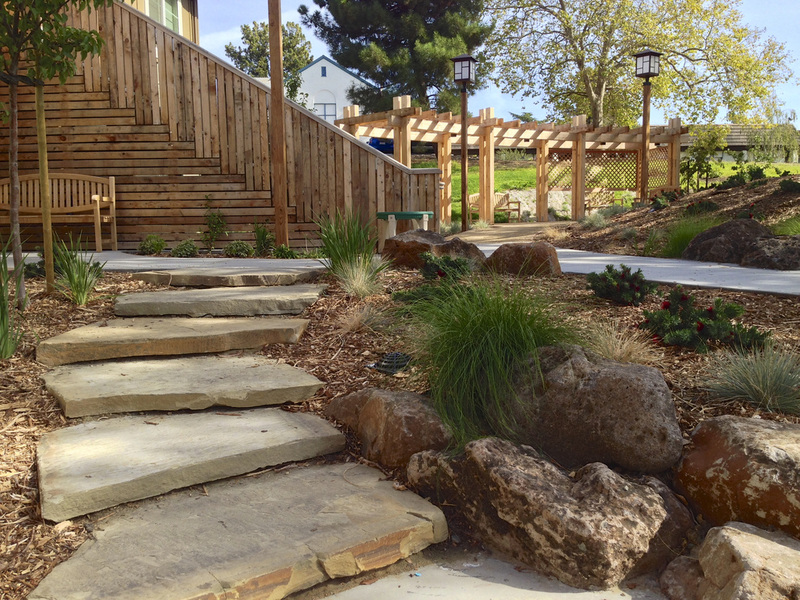 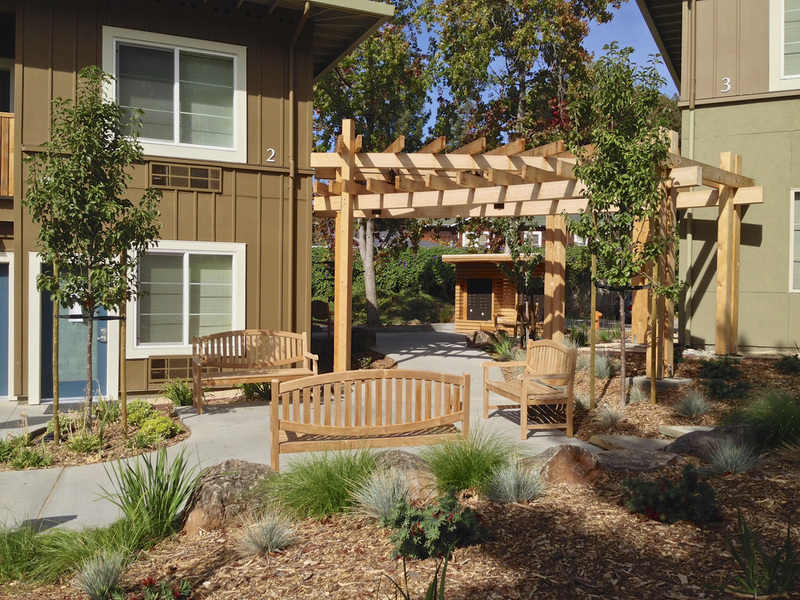 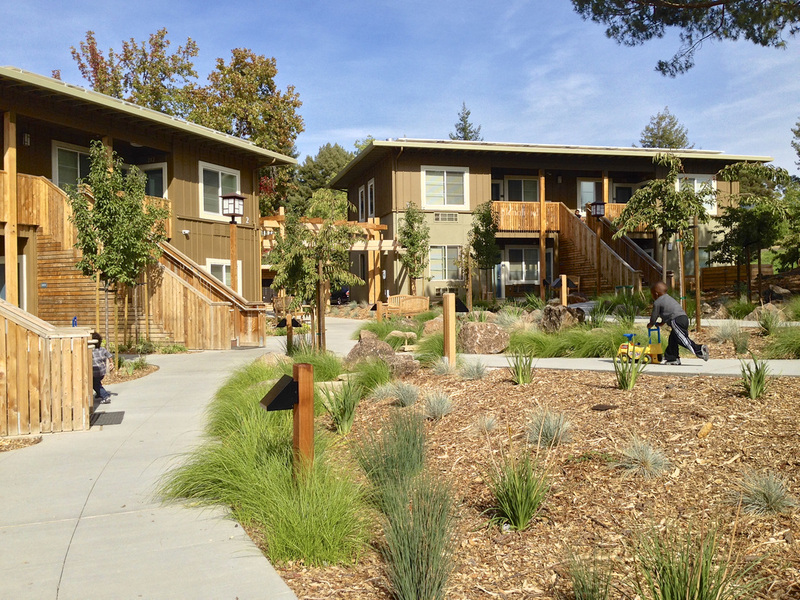 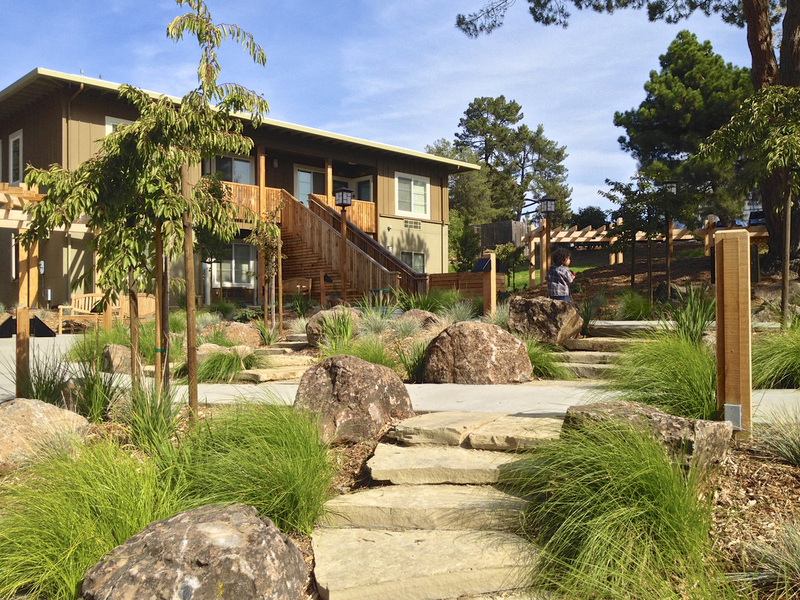 All of our housing projects have multi-layered outdoor spaces that are loved by the residents. 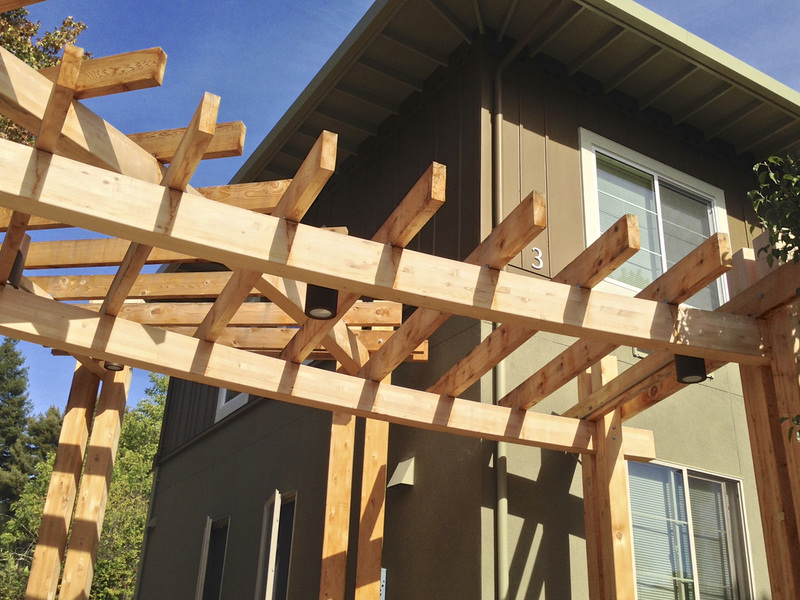 Our site design geometries make the eye relax. 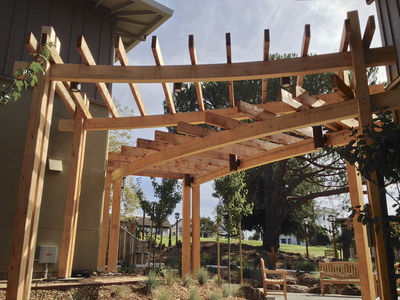 The site design started with a towering, stately Italian Stone Pine. Our three buildings frame it, and walkways wrap around the space while cleverly creating and accessible path of travel without the need for formal ramps and handrails. This is a Universal Design success that was challenging to work out, but that creates a comfortable and relaxed, informal space that is 100% usable by everyone. 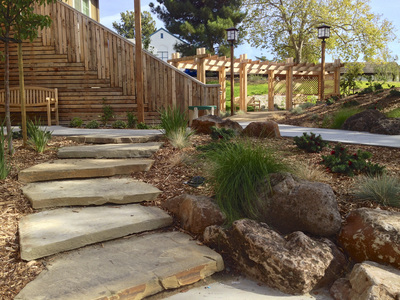 We went beyond the ADA (Americans with Disabilities Act) and building codes, and created an environment that is great for wheelchair riders, kids on scooters, parents with strollers, and anyone who has trouble with stairs. Every unit has natural cross-ventilation for comfort, with natural light from more than one side. 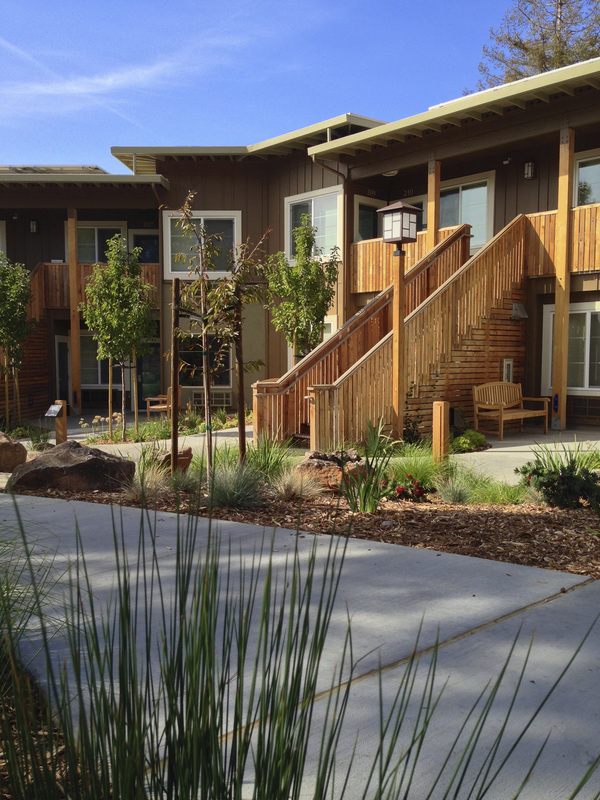 Materials throughout are low-VOC, with recycled content wherever possible. 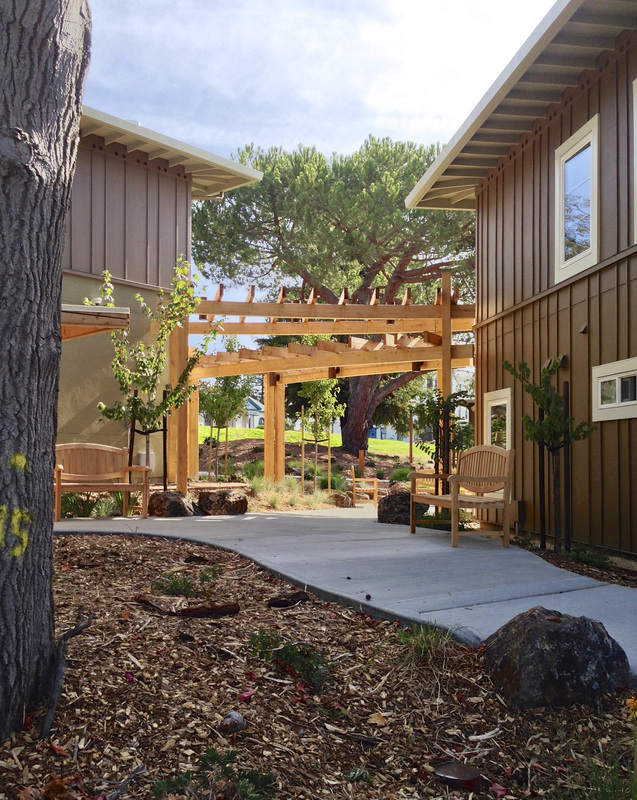 Rising Oaks is a safe, welcoming, and beautiful home where people can learn living and social skills and make a better life for themselves.